For about 54min from 22:46 - 23:40 on Tue 10 Apr, a significant amount of global traffic was unable to reach our data centres. From 22:53 - 23:03 (10min), "Transmission cp10xx (eqiad)" was down 70% (dropped from 10 GBit/s to 3 GBit/s). The bottom lasted for about 5min (22:55 - 23:00). From 22:46 - 23:24 (40min), "Transmission cp50x (eqsin)" was down 90% (dropped from 1.6 GBits to 0.12 Gbit/s). The bottom lasted about 30min (23:50 - 23:20). Page views (1:100 samples) dropped from 170/min to <10/min (down 90%). 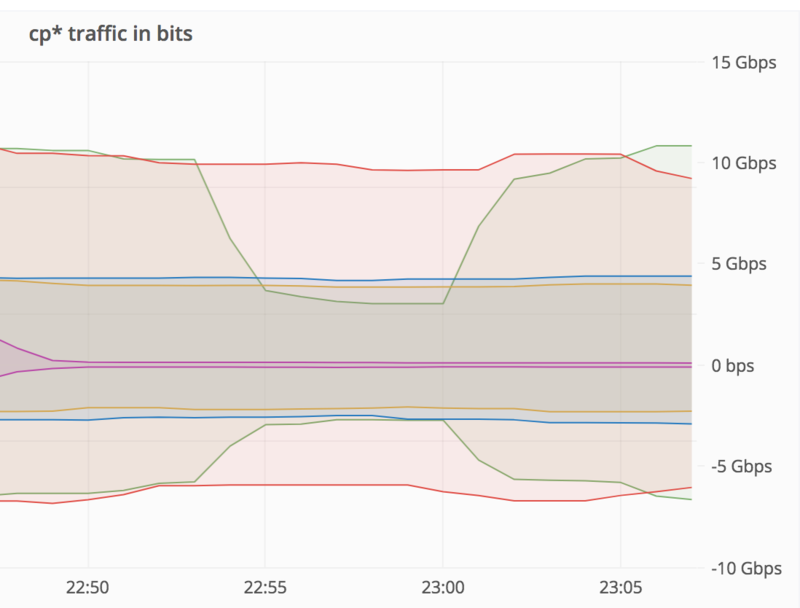 This is based on client-side Geo and indicates that traffic was really down (as opposed to re-routed). They still don't load for me. I think this is about April 10, not April 11. And now dead again. Affects www.wikipedia.org, commons, wikidata, wiktionary. This was caused by a change made for T191667, more specifically enabling nonstop-routing on cr1/2-eqiad and cr1-eqsin. I applied the change to cr1-eqiad (redundant), cr2-esams (middle of the night), which went fine, cr1-eqsin, then cr2-eqiad. First observations seems to indicate that it have triggered a bug on cr2-eqiad and at least withdrawn the prefixes advertised from eqiad. Change have been rolledback 4min later. 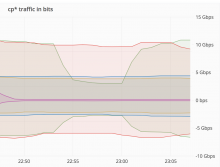 cr1-eqsin was a different kind of partial routing daemon failure, where rpd was at 100% CPU and the router was dropping most of the traffic (alerting was flapping), but still advertising its prefixes. Rolling back the change did not fix the issue, running a commit full neither (at least not promptly). The site has been depolled. Router seems to be back to a healthy state now. I will follow-up with the vendor. ema moved this task from Triage to Network on the Traffic board. [operations/dns@master] Revert "Depolling eqsin due to router issue"
Do you want to rephrase this task's description to be about the incident? As a "let's investigate what happened" task as it is now, it should be closed, because we now know what happened. Imarlier assigned this task to BBlack. Brandon - No further action for Performance on this. I'm assigning to you to close out or for further investigation, if any is needed.